How can I tell the difference between condensation and rising damp? 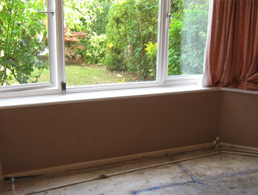 Home » Damp Proofing » How can I tell the difference between condensation and rising damp? Condensation is probably the most common form of dampness affecting buildings. Signs of condensation can include water droplets on windows, water collecting on window cills and commonly resulting in black mould growth on walls and ceilings, especially in corners and behind furniture, wardrobes etc. Mould growth may also occur within cupboards causing damage to shoes, leather goods, bags etc. Condensation has increased over recent years following the increased use of draught proofing. 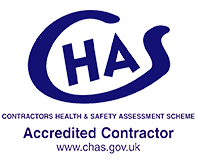 Additionally, high energy costs have resulted in the intermittent use / inadequate levels of heating being provided in many dwellings. Warm air will hold more moisture than cold air and therefore moisture held within the air will condense on cold surfaces when the property cools down. Multi occupancy also results in significantly more moisture being produced, which unless expelled from the property by means of adequate ventilation, will condense on cold surfaces, providing the ideal conditions for mould growth to develop. Rising dampness is an entirely different form of dampness, which occurs due to the lack of an effective damp proof course. A damp proof course is an impervious barrier at the base of the wall, often made of slate, felt or plastic. The most common form of remedial damp proof course is a waterproof chemical injected into the brickwork or mortar joint. 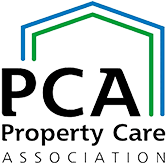 Commonly damp proof courses may be bridged by high external ground levels. Unlike condensation, the source of rising dampness is moisture from the ground, which in the absence of an effective damp proof course, can slowly rise into the brickwork resulting in damp patches and salt damage to the wall plaster. 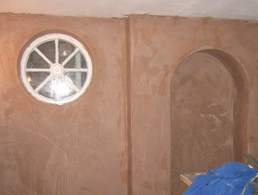 Effective treatment for rising dampness is likely to require a new damp proof course to be installed and the wall plaster to be replaced using a waterproof plaster, such as Kenwood Waterproof Rendering System. Rising dampness will not result in physical water on surfaces such as window sills, nor physical wetness or water on the surface of the wall, as the moisture rises through the brickwork very slowly by capillary action. Condensation is usually a seasonal problem, occurring particularly during the colder months from October to March. 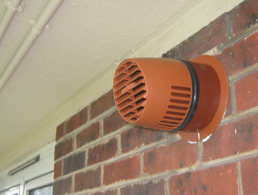 Where improvements in the management of heating and ventilation have not been sufficient, the most effective remedial method for overcoming condensation problems can be the use of Positive pressure ventilation systems and heat recovery ventilators such as Kenwood Condensation control systems. Further advise of dampness and condensation can be obtained from Kenwood Plc on 0208 950 9070.